In an effort to force myself to pick up my camera more (probably a good idea for a photographer:), I am tackling a personal photo challenge project. I need your help though, since I am very good at starting personal projects but never finishing them. If a day goes by in August that I don’t post a picture, come yell at me. You have my full permission and encouragement :). 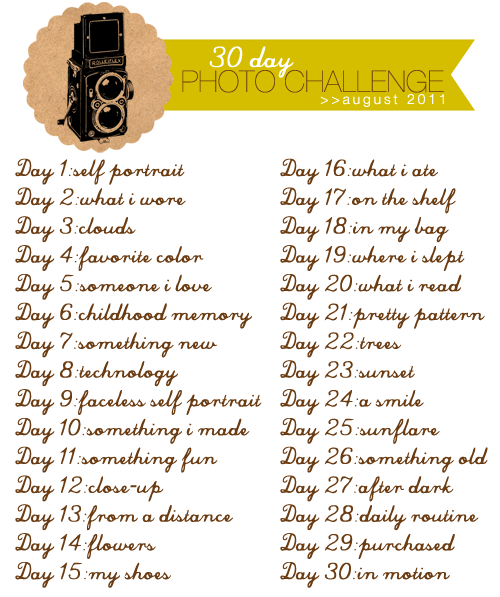 This challenge starts August 1st and even though we will be gone a few of those days, I will take a picture with my iPhone and post it, so I can’t slack by saying “oh, I’ll post when I get home” :). Feel free to come join in :). LOVE this challenge!!! As a starting photographer- I think I am going to try this! just to keep me on my toes!! Thanks!